darkness welcomes her slick sails. a bee procured about a clump of several species of nightshades, which were flowering in thinned-out jungle (based on Bees from British Guiana by T.D.A. one doesn’t know where it is. 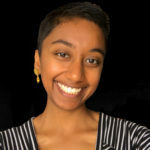 Divya M. Persaud is a writer, composer, and planetary scientist of Indo-Caribbean heritage from New Jersey. She is the recipient of The (Great) Indian Poetry Collective Editor’s Choice Award for her experimental book of poetry, do not perform this (GIPC, 2019), and the author of poetry collections color (2016) and de caelo et tellure (2015). Her poems have appeared in The Deaf Poets Society as well as The Aerogram. Divya is additionally the composer of THEY WILL BE FREE: a song cycle (2017), an album that fuses epic poetry and contemporary classical music. Divya is currently pursuing a Ph.D. in planetary imaging in the United Kingdom.